Today, I am jumping for joy! No, it's not because it's Christmas Eve and Santa will be coming tonight... it's because I reached a huge milestone in my weight loss journey! I was hoping to reach my goal by New Year's, but I managed to reach it before Christmas! Oh my goodness... I can't believe it! Since starting Nutrisystem, I have done so much more than I ever imagined possible. I've learned to manage my portions as well as the importance of drinking enough water. I've learned that I can still eat all the foods I love, moderation and self-control needs to be a part of my everyday routine. Moderation, determination, and being active are three keys to success! And most important... I CAN DO IT! That brings my total weight loss to 50.5 pounds! Now that I've reached my original weight loss goal, I'm aiming to lose another 10 pounds. 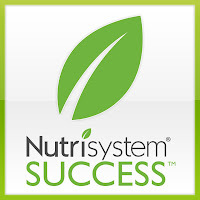 I will be on the Nutrisystem program for another 6 weeks, and I'm confident that I will make it! Woohoo, you made your goal, and over the holidays, congrats! Way to go! That is fantastic!!! That is fantastic, Congratulations! I know how hard it can be to make a goal weight. I have enjoyed watching your journey.